One of the most important parts of any 5S program is creating a visual workplace. 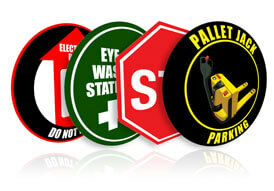 Labels and signs in your facility provide a quick reference for efficiency and organization. Whether it's rack labels, pipe markers, floor signs, warning labels, directional arrows or notice signs, visual indicators are key. 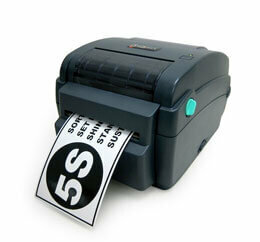 If you are implementing a 5S program, it can get costly buying labels from an online retailer. Making your own custom labels with your own industrial label printer will save you a great deal (up to 75%) in the long run. We have a variety of industrial label printers, label tape and ribbon supply available for you to create your own, custom labels and signs, right from your computer. If it's large, industrial floor signs you are after, we have a variety of standard floor signs available. In addition, if you need a custom floor sign, we will customize the sign for you at no additional charge.